It’s always good to get sandwiched by savings. On National Sandwich Day, there will be plenty of people celebrating by slathering their favorite condiments, along with meat and cheese, between two slices of bread. Food holiday or not, did you know it’s estimated more than 300 million sandwiches are consumed every day in the U.S.? However you order your favorite sandwich, you’ll definitely want to take a bite out of these deals on Saturday, November 3. The offers are available at participating locations, while supplies last. Erbert & Gerbert’s Sandwich Shop – All sandwiches are 50% off from 2 p.m. to 6 p.m. — in-store and drive-thru only. 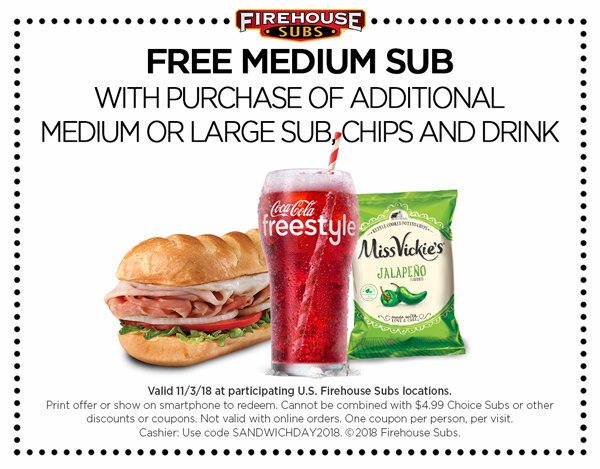 Firehouse Subs – Enjoy FREE medium sub with the purchase of additional medium (or large) sub, chips and drink — coupon required. McAlister’s Deli – Get its signature McAlister Club for $4, includes pickle and choice of side. Potbelly Sandwich Shop – Grab FREE sandwich or salad with the purchase of kids meal — for Potbelly Perks members only via its app. Schlotzsky’s – Get buy-one-get-one FREE medium sandwich. Really hungry? Double the meat for an extra $2. Smiling Moose Rocky Mountain Deli – Get buy-one-get-one FREE sandwich — click here promo Tweet. Quiznos – Get any 8″ sub for just $5 — coupon required.